(keyboards) and Matt Sorum (drums). Guns Ν’ Roses descended on Dayton this weekend, giving rise to a rash of “Slash sightings,” and an influx of rowdy rock fans. The band, which played the first of a two-night stand at Wright State University’s Ervin J. Nutter Center on Monday, arrived in town Saturday, surprising shoppers with a stroll through the Dayton Mall, and treating the patrons of McGuffy’s House of Draft to an impromptu blues jam on Sunday night. Despite the larger setting, 11,174 fans were anxiously awaiting Guns N’ Roses and opening act Sound-garden at the Nutter Center on Monday night. “They’re a bad powerful group — ya’ can’t stop ’em,” said David Cole of Kings Mill, who arrived at the concert hall at 4 p.m. to be the first in line when the doors opened at 6:30. Cole and his three friends had camped out for tickets to the show when they went on sale Dec. 14 — and promptly sold out in 72 minutes. Given Guns N’ Roses’ volatile nature — and the lingering memory of a riot that broke out at the band’s concert in St. Louis in July security at the Nutter Center was tighter than usual Monday night. In addition to the usual “pat down" endured before entering the arena, fans were also checked with metal detectors. “Our preparedness is at a higher level,” said Tom Oddy, director of the Nutter Center. The metal detectors were used to check con-cert-goers for bottles, cans, cameras and video and audio recording devices, he said. “Everyone understands that right up front,” Oddy said. "That’s not a problem." The overtime costs (which totaled $24,000 for one of the band’s shows at New York’s Madison Square Garden) are billed to the presenter, Cellar Door Concerts of Philadelphia “If it makes the difference to having a good show, a little bit of inconvenience is OK,” Oddy said The fans at the Nutter Center on Monday night were anticipating a VERY good show. “It's 100 percent pure adrenalin," said Diane Longstratt of Philadelphia, who has been following Ν' Roses from city to city with her companion Christopher Crist. The two have become friends with members of the band and had complimentary tickets and backstage passes waiting for them at the box office. “They’re not rowdy, obnoxious people," Crist stressed. “They’re normal people. They’re all cool.” Shawn Sullivan of Huber Heights, a second year student at Harvard Law School in Cambridge. Mass., also follows the band and flew home for the concerts. Sullivan befriended GN’R bassist Duff McKagan after the latter told a Rolling Stone reporter that he would like to someday attend Harvard Law School. We said. "Well, c’mon down, Duff, and we'll give you a tour of the campus," Sullivan recalled. The bassist took him up on his offer and repaid Sullivan with a V.I.P pass for the entire tour. One of Guns Ν’ Roses biggest hits is a song titled Patience. Patience, ironically, is what a large number of the rock band’s fans lost when its show scheduled for Monday night at Wright State University’s Ervin J. Nutter Center failed to start until 12:25 a.m. Tuesday. 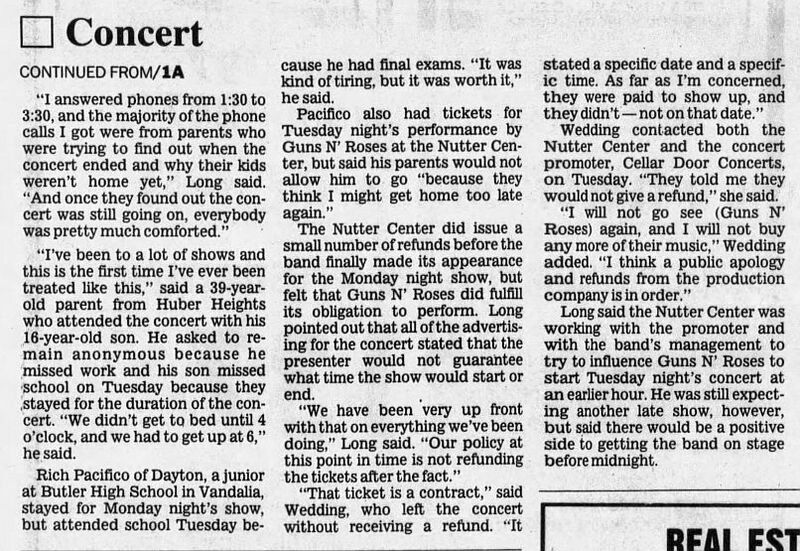 It didn’t end until 3:05 a.m.
A crowd of about 20 people gathered outside the Nutter Center’s administrative office angrily demanding refunds after Slash, Guns N’ Roses’ guitarist, announced at 11:52 p.m. that the show would be delayed because of a technical problem with the band’s stage monitors. The show had been scheduled to start “around 8 p.m.,” according to the tickets. Opening act Soundgarden played from 9:30 to 10:30 p.m. Despite Slash’s statement, no one was seen on stage or at the sound board attempting to correct the problem with the monitors, and several members of the Nutter Center’s support staff said that the band’s singer, Axl Rose, did not arrive at the venue until after midnight. Guns N’ Roses has been starting its shows around 11 p.m. and playing until 1:30 a.m. on previous stops on this leg of the band’s tour. A number of fans left the venue over the course of the performance Monday, but the majority of the audience of 11,174 stayed. Many younger fans formed long lines at the facility’s pay phones to alert , their parents that the show was running late. “I’ve been to a lot of shows and this is the first time I’ve ever been treated like this,” said a 39-year-old parent from Huber Heights who attended the concert with his 16-year-old son. He asked to remain anonymous because he missed work and his son missed school on Tuesday because they stayed for the duration of the concert. “We didn’t get to bed until 4 o’clock, and we had to get up at 6,” he said. cause he had final exams. “It was kind of tiring, but it was worth it,” he said. 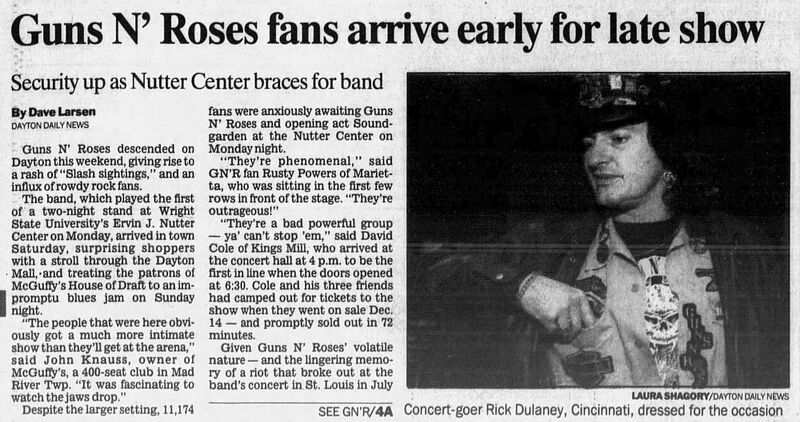 The Nutter Center did issue a small number of refunds before the band finally made its appearance for the Monday night show, but felt that Guns N’ Roses did fulfill its obligation to perform. Long pointed out that all of the advertising for the concert stated that the presenter would not guarantee what time the show would start or end. stated a specific date and a specific time. As far as I’m concerned, they were paid to show up, and they didn’t—not on that date.” Wedding contacted both the Nutter Center and the concert promoter, Cellar Door Concerts, on Tuesday. "They told me they would not give a refund,” she said. Long said the Nutter Center was working with the promoter and with the band’s management to try to influence Guns N’ Roses to start Tuesday night’s concert at an earlier hour. He was still expecting another late show, however, but said there would be a positive side to getting the band on stage before midnight. Guns N’ Roses, blaming a technical problem when an attitude problem seemed the more likely cause, started its Monday night performance at Wright State University’s Ervin J. Nutter Center at 12:25 Tuesday morning. The crowd grew increasingly unruly as the advertised “around 8 p.m.” showtime crept closer towards midnight. Slash, the band’s guitarist, announced that the main power amp on the stage monitor had blown. “I didn’t build the... equipment — I just play through it,” he told the booing crowd of 11,174. But the remarks of singer Axl Rose, whom a Nutter Center official said did not arrive at the venue until after midnight, rang closer to the truth. “You’ve got to realize that this is not a pleasant place for me to play,” said Rose, an Indiana native who explained that his step-father was from Dayton and that he had needed time to prepare himself mentally for the performance. 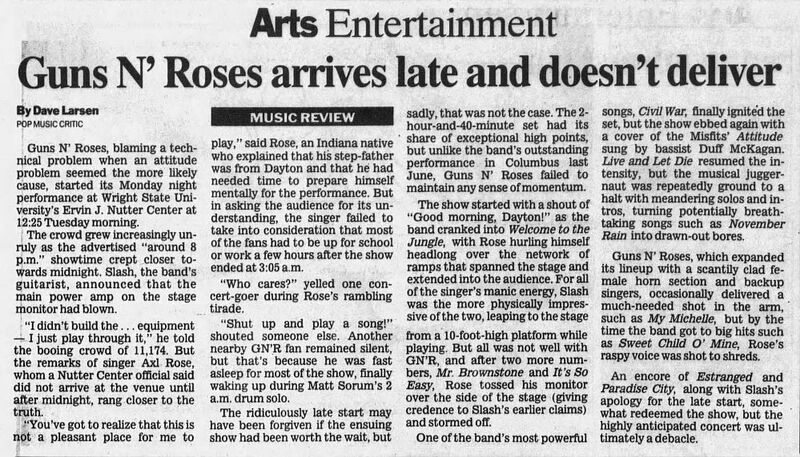 But in asking the audience for its understanding, the singer failed to take into consideration that most of the fans had to be up for school or work a few hours after the show ended at 3:05 a m.
“Who cares?” yelled one concert-goer during Rose’s rambling tirade. “Shut up and play a song!” shouted someone else. Another nearby GN’R fan remained silent, but that’s because he was fast asleep for most of the show, finally waking up during Matt Sorum’s 2 a.m. drum solo. sadly, that was not the case. The 2-hour-and-40-minute set had its share of exceptional high points, but unlike the band’s outstanding performance in Columbus last June, Guns N’ Roses failed to maintain any sense of momentum. The show started with a shout of “Good morning, Dayton!” as the band cranked into Welcome to the Jungle, with Rose hurling himself headlong over the network of ramps that spanned the stage and extended into the audience. For all of the singer’s manic energy, Slash was the more physically impressive of the two, leaping to the stage from a 10-foot-high platform while playing. But all was not well with GN’R, and after two more numbers, Mr Brownstone and It’s So Easy, Rose tossed his monitor over the side of the stage (giving credence to Slash’s earlier claims) and stormed off. One of the band’s most powerful songs, Civil War, finally ignited the set, but the show ebbed again with a cover of the Misfits’ Attitude sung by bassist Duff McKagan. Live and Let Die resumed the intensity, but the musical juggernaut was repeatedly ground to a halt with meandering solos and intros, turning potentially breathtaking songs such as November Rain into drawn-out bores. Guns N’ Roses, which expanded its lineup with a scantily clad female horn section and backup singers, occasionally delivered a much-needed shot in the arm, such as My Michelle, but by the time the band got to big hits such as Sweet Child O’ Mine, Rose’s raspy voice was shot to shreds. An encore of Estranged and Paradise City, along with Slash’s apology for the late start, somewhat redeemed the show, but the highly anticipated concert was ultimately a debacle. I am writing to complain about the Guns N’ Roses review Dave Larsen wrote (Jan. 15, “Guns N’ Roses arrives late and doesn’t deliver”). It was full of quotes that were out of context and bull...! I find it very amusing that he failed to mention what Axl Rose said about the media and that the Midwest in general was a ... place to be because of it. 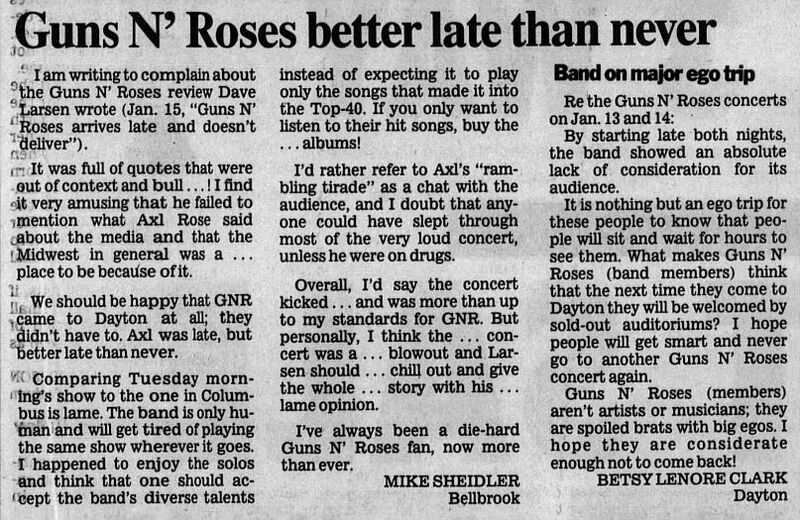 We should be happy that GNR came to Dayton at all; they didn’t have to. Axl was late, but better late than never. Comparing Tuesday morning’s show to the one in Columbus is lame. The band is only human and will get tired of playing the same show wherever it goes. I happened to enjoy the solos and think that one should accept the band’s diverse talents instead of expecting it to play only the songs that made it into the Top-40. If you only want to listen to their hit songs, buy the ... albums! I’d rather refer to Axl’s “rambling tirade” as a chat with the audience, and I doubt that anyone could have slept through most of the very loud concert, unless he were on drugs. Overall, I’d say the concert kicked... and was more than up to my standards for GNR. But personally, I think the ... concert was a ... blowout and Larsen should ... chill out and give the whole ... story with his ... lame opinion. I’ve always been a die-hard Guns N’ Roses fan, now more than ever. By starting late both nights, the band showed an absolute lack of consideration for its audience. It is nothing but an ego trip for these people to know that people will sit and wait for hours to see them. What makes Guns N’ Roses (band members) think that the next time they come to Dayton they will be welcomed by sold-out auditoriums? I hope people will get smart and never go to another Guns N’ Roses concert again. Guns N’ Roses (members) aren’t artists or musicians; they are spoiled brats with big egos. I hope they are considerate enough not to come back!